BRIAN WILLIAMS, anchor: Now to politics. The campaign saga of Herman Cain continued today as he continued to push back against the sexual harassment allegations swirling around him. And we may be close to hearing more of the story from one of the women who accused him of improper behavior. Our report from NBC 's Lisa Myers . LISA MYERS reporting: Just when you thought this story couldn't get more unusual, Herman Cain showed up on a conservative website this morning being interviewed by Jenny Thomas , the wife of Supreme Court Justice Clarence Thomas . The message, another black conservative is being mistreated by the media. Mr. HERMAN CAIN: That is the DC culture, guilty until proven innocent . MYERS: Clarence Thomas was accused of sexual harassment by Anita Hill during his confirmation hearings. And in the eyes of many conservatives, was badly treated by the media. Mr. CHARLIE COOK (NBC News Political Analyst): There are lots of conservative journalists he could have sat down with, but only one would have reminded people of Clarence Thomas and the whole Anita Hill affair. MYERS: Amid this media frenzy , Cain 's fundraising has actually soared. Advisers say he's collected more than a million dollars online in four days. Cain was pressed by conservative Sean Hannity about the reports this week that three women complained in the 1990s about Cain 's inappropriate sexual conduct. MYERS: Earlier this year Cain assured a conservative blogger he had no skeletons in his closet. 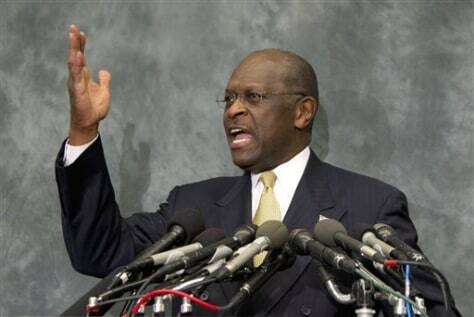 Mr. CAIN: I can assure you, I have an original copy of my birth certificate. I don't have any illegitimate babies. I don't have any mistresses. MYERS: Cain 's campaign manager is calling on all his accusers to stop hiding behind anonymity. Mr. MARK BLOCK (Cain Campaign Manager): I would challenge anybody that has these statements to be made to come forward with the person making the statements, face Mr. Cain . MYERS: One accuser who had said she wanted to get her story out now says she's decided to let her lawyer, Joel Bennett , do the talking because "she doesn't want to become another Anita Hill ." Mr. JOEL BENNETT: She's a very intelligent, highly educated woman and she's trying to live a normal life. incidence. Brian: Lisa Myers in DC tonight, thanks.